If you are near Samarkand next week, do not miss Sharq Taronalari (Oriental Melodies), the biennial world music festival at the Registan, from 25-30 August. This year marks the 8th staging of this event and is being supported by UNESCO to celebrate 20 years of Uzbekistan’s independence. From ancient times, Samarkand has been a flourishing cultural crossroads, and home to a rich musical tradition born from the interaction between different cultures. The festival, an initiative of Uzbek President Islam Karimov, aims to foster international cooperation by building close contact between artists and musicians from different countries. The festival seeks to popularise the best of national music. There are three categories of competition that an international jury will evaluate: traditional folk songs (best performance of the national song), traditional national music and contemporary national music and performance. Organizers have confirmed that performers from 46 countries will participate. It will be Cuba's first time in the festival. As well as the Registan square, performances will be held in parks, the amphitheatre and throughout the city. Thanks to satellite broadcasting the event will be televised in almost 100 countries. 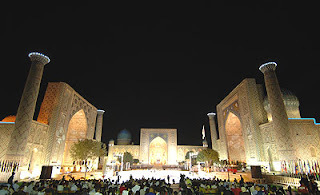 A visit to Samarkand for Sharq Taronalari is on my 'must do' list. How exciting to be there as Samarkand morphs into a musical melting pot, resonating to sounds, song and dance from around the globe. Throw famous Uzbek warmth and hospitality into the mix and what a festival it must be. The clip below of the Italian group i Viulan, performing in 2009, gives a taste of the setting and atmosphere.